He made the 53-man roster at the close of the preseason, then was released after the team needed cornerback help following the foot injury suffered by Ron Brooks in the opener. Now DL Jay Ross is tweeting that he’s going to rejoin the Bills. The team has not confirmed the signing, but if things play out as Ross indicates he will help to fill the void left behind by Alex Carrington, who was lost for the season after tearing his quadriceps tendon. Bills DT Jay Ross, who was released Tuesday to make room on the roster for another cornerback, unfortunately can’t be signed to the team’s practice squad provided he clears waivers. Ross is out of practice squad eligibility. The defensive tackle worked his tail off to make the 53-man roster, but demands at other positions unfortunately moved him off the squad. The East Carolina product figures to be a consideration later this season should he be available as a free agent and injury strike at the defensive tackle position. Buffalo’s starting defensive line is largely set with Marcell Dareus and Kyle Williams doing the dirty work in the middle. Behind them on the depth chart a tight battle is brewing between a handful of reserve candidates. Players like Torell Troup, Jay Ross, Alan Branch, Jarron Gilbert and Corbin Bryant has all seen time inside. Several of them have been rotated in with the first unit as well for an extended look at times during the first two-plus week of training camp. Defensive coordinator Mike Pettine admitted that was by design. Pettine has said more than once that versatility is the strength of his defensive scheme, with several players asked to know how to effectively play two positions. For defensive tackles however, the versatility isn’t as high a priority. Troup and Branch have fared well when it’s come to neutralizing a double team to let other defenders make plays. Ross, Bryant and Gilbert have been in the offensive backfield more as penetrators. The next two preseason games will likely determine who sticks knowing that most NFL clubs rarely carry more than four DTs. 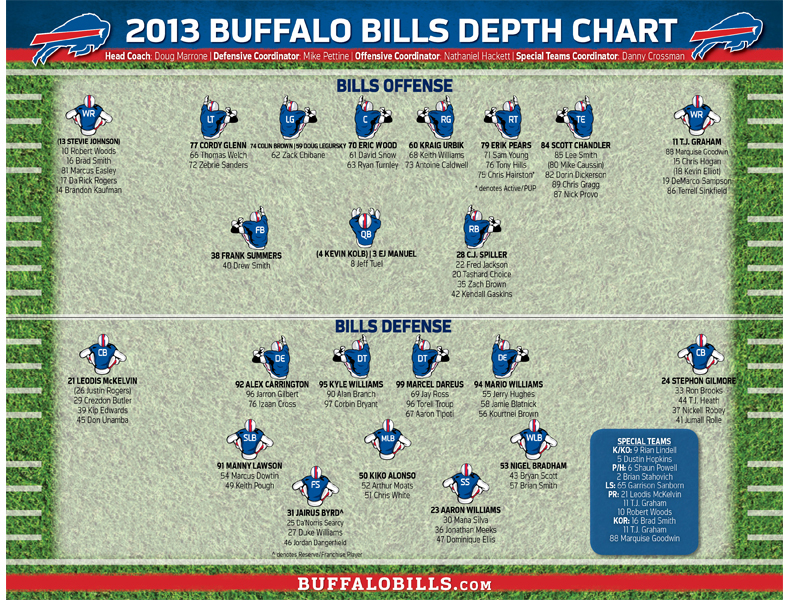 There really weren’t any surprises on Buffalo’s first unofficial depth chart of the preseason released by the team Monday afternoon, but there are a couple of non-starter roles that were worth noting. Jarron Gilbert, who made the team’s practice squad last season, is listed as a second-team left DE. He’s been getting consistent reps with the second unit there and has even been sprinkled in for some first team reps.
Gilbert does have familiarity with Mike Pettine’s scheme, having played in it for the better part of two seasons from 2010 to 2011 as a member of the Jets practice squad and active roster as he yo-yo’ed up and down between the two during those years. Torell Troup meanwhile is listed as a third-team DT even though he’s been used a good deal with the second unit. DT Jay Ross, who has seen reps with the starters due to the limited workload of Kyle Williams is a second team DT. C-G David Snow and DT Jay Ross were called up from the practice squad on Saturday. Here are the jersey numbers they’ll be wearing today. Snow will wear jersey number 61. Ross will wear jersey number 73. Also recently signed OL Reggie Wells will wear jersey number 68.